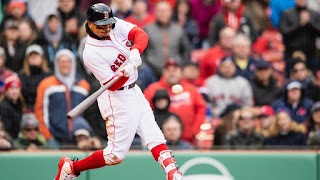 The Red Sox rallied for six runs in the bottom of the eighth inning - all scoring after there were two outs - to beat the Rays 8-7 Sunday afternoon at Fenway Park. It was the eighth straight win for Boston, giving the team an 8-1 record for the first time in franchise history. The Rays had scored in each inning from the second through the seventh and had a 7-2 lead heading into the bottom of the eighth. Hanley Ramirez led the inning off with a single which was followed by a J.D. Martinez strike out and a Brock Holt fly to left. And that's then the Red Sox went to work. Mitch Moreland doubled off the Wall to drive in Ramirez. Eduardo Nunez singled him to third and both were driven in on a double to left by Rafael Devers. Christian Vazquez delivered an RBI single and after advancing to second on a wild pitch, he scored on a base hit by Mookie Betts. Andrew Benintendi followed with an RBI double to give Boston an 8-7 lead. Carson Smith got the win in relief and Craig Kimbrel notched his third save of the year with a clean ninth inning. Eduardo Rodriguez started for the Red Sox but only lasted 3.2 innings, charged with three runs on five hits and a pair of walks. He struck out seven in the no-decision. Xander Bogaerts left the game in the top of the seventh inning with an ankle injury. He will be evaluated on Monday.